I am not going to give a blow-by-blow of the full tours that I take in the course (then you’d have no reason to hire me as a tour guide when I’m done! ), but I do plan to highlight some of the interesting tidbits I learn along the way. Let me also say that I had to leave before the end of the day, so my day was more about the footsteps of Samson and not really those of David! So, a few of the cool places we visited. 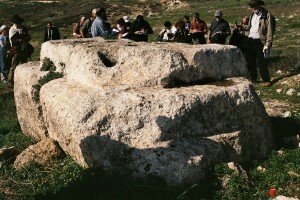 One that I found pretty neat was “Manoach’s Altar.” It is a large, carved stone in the middle of a field. In the Biblical story of Shimshon, Manoach (Samson’s father) offers a sacrifice which is miraculously consumed in flames, and then an angel ascends to heaven from atop the altar. This stone in the field, for various reasons, is believed to be that altar. (By the way, I’ll discuss a drop later the issue of how we know places are what people say they are.) Whether it is or isn’t, archaeologists generally agree that this is very old, and was used for some sort of religious purpose. Beit Meir, our first stop, was a great place to look out over the Shefelah, so this is as good a time as any for me to summarize a few details about Israel’s geography. The bulk of the northern half of Israel is divided into bands that run north-south. The Coastal Plain runs (oddly enough) along the coast. 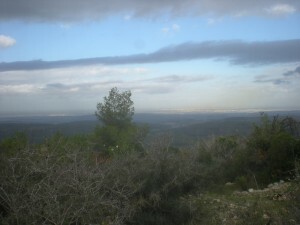 To the east of that are foothills, known as the Shefelah. Technically, these may be split into Lower (100-300 meters above sea level) and Upper (300-450 or 500) Shefelah. East of the Shefelah are the Judean or Jerusalem and Samarian Hills. And then east of this mountain range lies the Jordan rift valley. The western edge of the Judean Hills “reach out” towards the Shefelah in a series of finger-like ridges. We looked out from the end of one of these. One interesting sidenote. Why would hills that run from 100 to nearly 500 meters above sea level be called “Lowlands?” To answer this, one must remember that the Israelites entered the land of Israel not from the south west and the Coastal Plain. Rather, they circled around and entered from east of the Jordan river. Thus, after coming into the Judean Hills, they were able to look down on the foothills of the Shefelah, which looked “low,” as opposed to looking up at them from the coast, and then encountering even higher mountains east of these foothills. Lastly, a couple of more technical discussions and observations we had. Firstly, as a person with a background in screenwriting, and thus storytelling, I was pleased to see the use of the technique known as a “callback” or a “plant and payoff.” A few times the tourguide who led us would mention something in passing when we saw it, only to call it back later in the day when it was something of greater significance. This is a satisfying technique for an audience! Another interesting note. 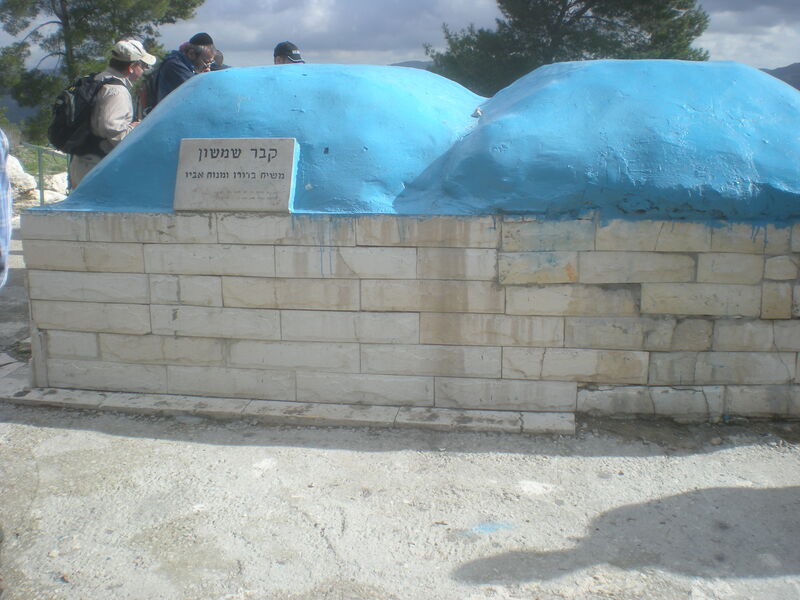 We visited two sites during the day that are considered the burial sites of famous biblical figures. The first was Dan, the son of Jacob, head of the tribe of Dan, and the second was supposedly the tomb of Samson himself (and his father, whom he was buried next to). There is, however, significant doubt if Dan is actually buried at kever Dan (Dan’s tomb). And for reasons based on the text of the Tanach (Jewish Bible), Samson is almost certainly not buried in kever Shimshon. So we discussed the accuracy of such claims, and also how they relate to tourism in Israel. For starters, we spoke about the ways that we can make educated guesses about “Biblical geography.” We also discussed when, where and to whom it is appropriate to have such discussions (i.e. not right inside the tomb’s building, where you might easily anger others there). But what I found to be a very salient point was that we do not, at least in Judaism, pray to dead people. When people pray at gravesites, it is usually to entreaty God as we would elsewhere, but recognizing the holiness of the person who died, and hoping that will help as a conduit of sorts. So what our guide said was that in many ways it matters less who (if anyone) is buried at these sites. What matters is that people have been visiting these sites for many years, and praying there. This is what makes a place holy, and we owe these places some reverence for this reason alone. Interesting though, no? What do you think?